I hope you’re all enjoying this special time of year. I’d like to share a story that was sent to me from a friend of mine who writes an inspirational e-letter called, “Letters from Larry.” It’s very long, but I hope you’ll find it worth the read. The old man sat in his gas station on a cold Christmas Eve. He hadn't been anywhere in years since his wife had passed away. He had no decorations, no tree, and no lights. It was just another day to him. He didn't hate Christmas, just couldn't find a reason to celebrate. There were no children in his life. His wife had gone. He was sitting there looking at the snow that had been falling for the last hour and wondering what it was all about when the door opened and a homeless man stepped through. Instead of throwing the man out, George – Old George, as he was known by his customers – told the man to come and sit by the space heater and warm-up. "Not without something hot in your belly," George turned and opened a wide mouth Thermos and handed it to the stranger. "It ain't much, but it's hot and tasty. Stew. Made it myself. When you're done there's coffee and it's fresh." Just at that moment he heard the "ding" of the driveway bell. "Excuse me, be right back," George said. There in the driveway was an old ‘53 Chevy. Steam was rolling out of the front. The driver was panicked. "Mister, can you help me?" the driver asked with a deep Spanish accent. "My wife is with child and my car is broken!" George opened the hood. It was bad. The block looked cracked from the cold; the car was dead. "You ain't going anywhere in this thing," George said as he turned away. "But Mister. You gotta help us…." The door of the office closed behind George as he went in. George went to the office wall and got the keys to his old truck, and went back outside. He walked around the building and opened the garage, started the truck and drove it around to where the couple was waiting. "Here, you can borrow my truck," he said. "She ain't the best thing you ever looked at, but she runs real good." George helped put the woman in the truck and watched as it sped off into the night. George turned and walked back inside the office. "Glad I loaned 'em the truck. Their tires were shot too. That 'ol truck has brand new tires........" George thought he was talking to the stranger, but the man had gone. The thermos was on the desk, empty, with a used coffee cup beside it. "Well, at least he got something in his belly," George thought. George went back outside to see if the old Chevy would start. It cranked slowly, but it started. He pulled it into the garage where the truck had been. He thought he would tinker with it for something to do. Christmas Eve meant no customers. He discovered the block hadn't cracked, it was just the bottom hose on the radiator. "Well, I can fix this," he said to himself. So he put a new one on. "Those tires ain't gonna get 'em through the winter either." He took the snow treads off of his wife's old Lincoln. They were like new and he wasn't going to drive the car. "Pressure to stop the bleeding," he thought. The laundry company had been there that morning and had left clean shop towels. He used those and duct tape to bind the wound. "Hey, they say duct tape can fix anything," he said, trying to make the policeman feel at ease. "Something for pain," George thought. All he had was the pills he used for his back. "These ought to work." He put some water in a cup and gave the policeman the pills. "You hang in there. I'm going to get you an ambulance." George said, but the phone was dead. "Maybe I can get one of your buddies on that there talk box out in your police car." He went out only to find that a bullet had gone into the dashboard destroying the two way radio. He went back in to find the policeman sitting up. "Thanks," said the officer. "You could have left me there. The guy that shot me is still in the area." George sat down beside him. "I would never leave an injured man in the Army and I ain't gonna leave you." George pulled back the bandage to check for bleeding. "Looks worse than what it is. Bullet passed right through 'ya. Good thing it missed the important stuff though. I think with time you’re gonna be right as rain." George got up and poured a cup of coffee. "How do you take it?" he asked. "None for me," said the officer. "Oh, yer gonna drink this. Best in the city." Then George added: "Too bad I ain't got no donuts." The officer laughed and winced at the same time. The front door of the office flew open. In burst a young man with a gun. "Give me all your cash! Do it now!" the young man yelled. His hand was shaking and George could tell that he had never done anything like this before. "That's the guy that shot me!" exclaimed the officer. "Son, why are you doing this?" asked George. "You need to put the cannon away. Somebody else might get hurt." the cash!" The cop was reaching for his gun. "Put that thing away," George said to the cop. "We got one too many in here now." He turned his attention to the young man. "Son, it's Christmas Eve. If you need the money, well then, here. It ain't much, but it's all I got. Now put that pee shooter away." George pulled $150 out of his pocket and handed it to the young man, reaching for the barrel of the gun at the same time. The young man released his grip on the gun, fell to his knees and began to cry. "I'm not very good at this am I? All I wanted was to buy something for my wife and son," he went on. "I've lost my job. My rent is due. My car got repossessed last week..." George handed the gun to the cop. "Son, we all get in a bit of a squeeze now and then. The road gets hard sometimes, but we make it through the best we can." He got the young man to his feet, and sat him down on a chair across from the cop. George handed the young man a cup of coffee. "Sometimes we do stupid things. Being stupid is one of the things that makes us human. Comin' in here with a gun ain't the answer. Now sit there and get warm and we'll sort this thing out." "Chuck! You ok?" one of the cops asked the wounded officer. "Not bad for a guy who took a bullet. How did you find me?" "GPS locator in the car. Best thing since sliced bread. Who did this?" the other cop asked as he approached the young man. Chuck answered him, "I don't know. The guy ran off into the dark. Just dropped his gun and ran." George and the young man both looked puzzled at each other. "That guy works here," the wounded cop continued. "Yep," George said. "Just hired him this morning. Boy lost his job." "Well, looks like you got one doozy of a break there. That ought to solve some of your problems." George went into the back room and came out with a box. He pulled out a ring box. "Here you go. Something for the little woman. I don't think Martha would mind. She said it would come in handy some day." The young man looked inside to see the biggest diamond ring he ever laid his eyes on. "I can't take this," the young man said. "It means something to you." "And now it means something to you," George replied. "I got my memories. That's all I need." George reached into the box again. A toy airplane, a racing car and a little metal truck appeared next. They were toys that the oil company had left for him to sell. "Here's something for that little man of yours." The young man began to cry again as he handed the $150 back to Old George. "And what are you supposed to buy Christmas dinner with? You keep that, too. Count it as part of your first week's pay,” George said. "Now git on home to your family, son." The young man turned with tears streaming down his face. "I'll be here in the morning for work, if that job offer is still good." "Nope,” George replied. “I'm closed Christmas day. See ya the day after." George turned around to find that the stranger had returned. "Where'd you come from? I thought you left." "Well, after my wife passed away I just couldn't see what all the bother was. Puttin'up a tree and all seemed like a waste of a good pine. Bakin' cookies like Martha and I used to just wasn't the same by myself. Besides, I was getting a little chubby,” George said with a chuckle. The stranger put his hand on George's shoulder. “But you do celebrate the Christmas, George. You gave me food and drink and warmed me when I was cold and hungry. You helped the woman with child. She will bear a son and he will become a great doctor one day. The policeman you helped will go on to save 19 people from being killed by terrorists. The young man who tried to rob you will become a rich man and share his wealth with many people. That is the spirit of the season, and you keep it as good as any man – if not better." George was taken aback by the words this stranger had said. "And how do you know all this?" asked the old man. "Trust me, George. I have the inside track on this sort of thing. And when your days on earth are done, you will be with Martha again." The stranger moved toward the door. "If you’ll excuse me, George, I have to go now. I have to go home where there is a big celebration planned." Christmas has become so many things. It’s really easy to get so caught up in the hustle and bustle that we lose sight of what it’s really all about –the birth of Jesus. I hate to admit this, but there have been times when I’ve felt like Scrooge on Christmas Day. When the big day finally arrived, I would be so burned out that my Christmas spirit would be on “e”. It’s supposed to be a happy time of year, but by the time I’d mailed 200 Christmas cards, put up the tree and decorated the house, and shopped and wrapped presents for everyone in the family, I would be drained emotionally and physically (and sometimes financially)! Then when I’d find the toys I’d purchased for the boys in pieces under their beds two weeks later, that only compounded my frustration. All that effort, only to find that the toys were either lost or they’d lost interest in the toys. But God gave us a gift that will last for eternity. My ideal Christmas would minimize the gift-giving aspect and place more emphasis on being together and making memories. I love spending time with my family. I’m especially looking forward to being home for the holidays this year, after being in Carson City for the past six weeks. To me, the greatest gift any of my children could give me is their presence – not their presents. The nice thing about making memories is that memories last a lifetime. Memories don’t cost anything. They don’t wear out, or break, or go out of style. And best of all, memories don’t have to be returned! Now there’s a gift that’s truly priceless! I still cherish the memories of Christmas celebrations from when I was growing up. My sister Connie would dress up as Santa Claus every year and all the younger kids would stand in awe when we heard the ringing bells and saw Santa walking across the front lawn, carrying a sack of goodies and ho-ho-ho-ing! We all took turns sitting on Santa’s lap, telling “him” what we wanted for Christmas – never realizing it was really our sister. I also have fond memories of singing Christmas carols and putting on skits each year on Christmas Eve. 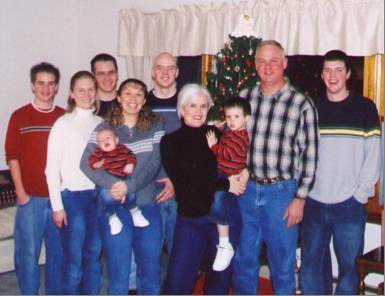 It was a full-fledged Van Kirk family variety show. Some of the more popular skits were repeated annually, but there were usually one or two originals performed each year. I remember the laughs my brother Bill and I got from the audience when we dressed up in our long underwear and sang, “Walking in our winter underwear” to the tune of “Walking in a Winter Wonderland.” When it came to the part in the song where it says, “Later on, we’ll conspire, as we sit by the fire…,” we changed it to, “Later on, we’ll perspire, as we sit by the fire…,” and wiped the imaginary sweat off our brows. 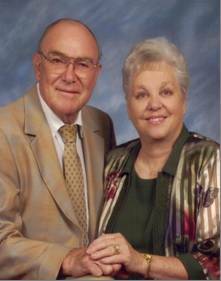 Recently a friend of mine shared a poignant story from Gerald Bath about a missionary teaching in Africa. Before Christmas he had been telling his native students how Christians, as an expression of their joy, gave one another presents on Christ's birthday. On Christmas morning, one of the natives brought the missionary a seashell of immense beauty. When asked where he had discovered such an extraordinary shell, the native said he had walked many miles to a certain bay, the only spot where such shells could be found. “I think it was wonderful of you to travel so far to get this beautiful gift for me," the teacher exclaimed. His eyes brightening, the native answered, "Long walk part of gift." 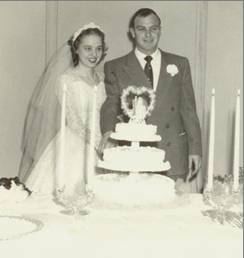 My mother and father-in-law, Jim and Jean Umbehr, were married on the twelfth day of the twelfth month in 1953. Tomorrow they will be celebrating their 50th anniversary. What an amazing milestone. Congratulations, Mom and Dad! I wonder what their parents thought when they decided to get married. Jim didn't have a job and Jean was still in nursing school. It reminds me of the words to Tanya Tucker's song titled, Two Sparrows in a Hurricane. The world says they'll never make it, love says they will. Jim and Jean have had a very adventurous life together. They had three children - Kihm, Keen and Kevin (that was an adventure right there!). But when their children were small, the oil company Jim worked for transferred him to Africa. They lived in Nigeria and Angola, Africa. Keen said when they played outside, the neighborhood kids used to rub their arms to see if the white would rub off their skin. Later, the Umbehr family moved to Singapore where they lived for about eight years. What a great experience - growing up overseas. Of course, Keen and I met while we were both attending Singapore American School so our parents watched our love blossom from high school sweethearts to husband and wife. Who would have thunk it? During our high school years, Keen's parents were always good sports about letting large groups of kids come over to their house. They had this huge, rectangular shaped living room. I remember one time they moved all of their furniture to the edges of the room so we could have a square dance. The first time Keen and I really met was at the pool where his family lived. A whole group of kids were playing "Marco Polo" until there was no one left in the pool but the two of us. I had a huge crush on Keen, but I didn't think he knew I existed. Needless to say, I was one very happy teenage camper that day. One time Keen and I got into trouble with both of our parents because we stayed out too late. If we had only known how much turmoil we were going to cause! I remember Keen's parents made him call my mom and apologize for keeping me out so late. My mom was pretty impressed by that, and soon all was forgiven. Based on the tears shed at our wedding by Keen’s side of the family, I’m not sure his folks were quite ready for us to get married as young as we did (we were both 19). My folks, on the other hand, were grinning from ear to ear. Keen's mom once told me that time seemed to fly when her kids were growing up. Then one day she woke up and said, "Where did everybody go? It was just starting to get fun." Keen was very blessed with great parents who loved, nurtured and supported him through every phase of his life and I am eternally grateful to them for blessing me with such a wonderful life partner. Brad Paisley wrote a song titled, "Two People Fell in Love" that seems very fitting. Wishing you many more years of love and happiness, Mom and Dad. Someone once said that strangers are just friends waiting to happen. When we moved to Alma in 1979, I was a newlywed with a baby on the way. Keen’s uncle and aunt lived out in the country, but other than them, I didn’t know a soul. That’s why I was so grateful for the kindness of the widow woman next door who would soon become one of my dearest friends. Mrs. Florence Thowe (pronounced “Tobie”) made me feel so welcome. I enjoyed her company and she enjoyed mine. We never ran out of things to talk about. Sometimes I’d call to see if she wanted to ride to Manhattan with me, and she always enjoyed getting out of the house and seeing the scenery along the way. Mrs. Thowe was so appreciative of any little thing we did for her. Of course, that only made us want to include her even more. She never put any expectations on our busy, young family. If we had time to visit, great, and if we didn’t, that was fine, too. She was just happy to see us whenever we had the time. Mrs. Thowe had a big drawer full of toys in her living room from when her kids and/or grandkids were little. Whenever I’d stop by for a visit, the kids would toddle right over to the drawer, pull it open and dig in. Everything was new to them, so it kept them busy and gave us a nice chance to visit. Mrs. Thowe liked to talk about her children - Kathy, Delores and Joe (a/k/a Jerry), and all of her grandchildren and great grandchildren (I used to know all of their names, too!). Whenever she received new pictures in the mail, she would proudly show them off. Mrs. Thowe enjoyed being outdoors and going for walks. She had a beautiful yard where she would spend lots of time tending to her flowers. 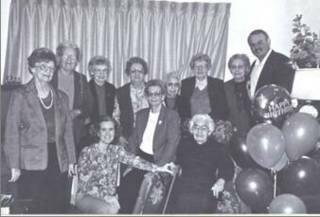 Mrs. Thowe was a member of a very special group of women who called themselves “The Golden Girls.” They would get together for social gatherings about once a month (if I remember right), and whenever it was someone’s birthday they would all go out for lunch and treat the birthday girl. When Mrs. Thowe turned 90, Keen and I took a van full of the Golden Girls to the nursing home in Olathe where Mrs. Thowe lived. Her children hosted a wonderful luncheon for all of us. It was such a memorable day. Whatever I witnessed that day, it seemed very special. I walked away with peace in my heart, knowing that this angel on earth would soon be joining the angels in Heaven. 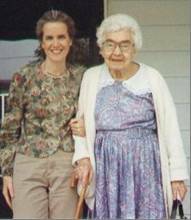 Here’s a poem I wrote in honor of Mrs. Thowe, who would have turned 103 this Sunday. In my thoughts and in my prayers. I’m glad she was my friend.